You’ve finally moved into your new home. But, like many new homeowners, you may not be familiar with construction standards or how your home was built — and how to maintain it. Many builders work hard to educate their buyers to help them avoidcommon mistakes that can lead to costly repairs. But many new homeowners move in and make changes without really understanding the ramifications of their actions. In fact, this is such a big problem that David E. MacLellan, a builder since 1969, has written a book with fellow authors George E. Wolfson, an architect, and Douglas Hansen, a general contractor, that details some of the common mistakes made by new homeowners. The book is called The Home Book: A Complete Guide to Homeowner and Homebuilder Responsibilities. MacLellan says that many of these mistakes can be costly to repair. And perhaps more important, they can void a homeowners warranty as well. Here are some of the most common — and potentially costly — mistakes made by new homeowners. Garage and attic trusses are designed to support the weight of the roof and ceiling and not much else. But many homeowners view this space as perfect for extra storage. Adding too much weight, however, might result in sagging or even a collapse of the roof structure. If you want to use this space for storage, consult a structural engineer in advance to see if additional reinforcements are needed. Similarly, adding pull-down steps to an attic or garage can be a bad idea as well. “Trusses are not designed to accommodate pull-down stairs,” says Ron Yuter, senior vice president of Boynton Beach, Fla.-based Ansca Homes. If you plan to add steps, make sure the structure can support the weight. Perhaps you want to add a patio or walkway — or some additional trees or landscaping — to your new home. In doing so, you might disrupt the drainage system around your home and cause water to flow back toward the house. Your builder will deliver your home with the lot carefully sloped so that water flows away from the house. 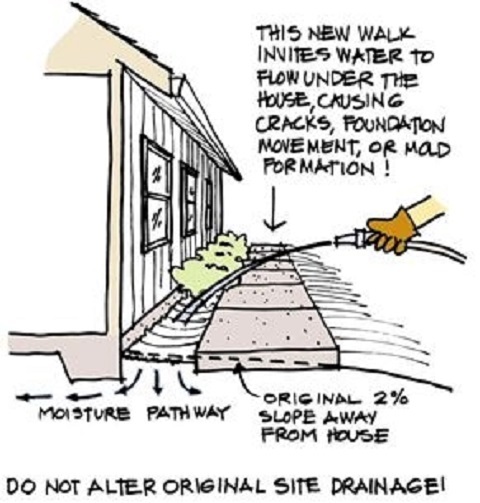 If you later add sidewalks or patios directly on top of the finished grade, the water may not drain properly and that can lead to costly repairs. Sprinkler heads that spray against your house can lead to rotted walls, leaching of color from the exterior walls or even movement of the foundation. Direct all sprinkler heads away from the home — and check them regularly to make sure they haven’t turned. Bathrooms and laundry rooms typically have high humidity. Fans should always be used in these rooms to avoid getting water vapor into your drywall, electrical outlets and framing. Not only is walking on the roof dangerous, but untrained persons can break or scuff the roof covering and cause roof leaks. Gutter maintenance should always be done from a ladder, not the top of the roof. Many residential warranties exclude damage resulting from unauthorized persons walking on a roof. Lower cabinets rest on the floor, but upper kitchen cabinets are hung from the walls. While it might be tempting to store extra sets of dishes in upper cabinets, this added weight could load the cabinet beyond its capacity and lead to sagging shelves or even detachment of the cabinet from the wall. You may have been given a survey of your new home at the closing or settlement. But if your property was not staked out by the surveyor, you might not be sure exactly where your properly lines lie. Wilber, from Grenadier Homes, says that the company reviews the plot and properly lines with all its homeowners so that they understand where their property begins and ends. This is particularly important if you plan to build a fence or do any planting near the property line. Encroaching on an adjacent property can not only cause problems between neighbors, but can also lead to your being forced to remove your fence or landscaping at additional cost. Be sure to know where your property lines are before doing any exterior work. Remember that your home is one of the most expensive investments in your life. The more you educate yourself — by studying any homeowner manuals provided by your builder or asking questions, particularly during the walkthrough — the greater the likelihood that you will avoid costly repairs to your beautiful new home.